Neither the ANC nor Good posed a real threat to the DA, which had entrenched itself in the province. ELECTIONS NEWS - The Western Cape is seen as the terrain for the intense contest and a two-horse race between the governing ANC and the Democratic Alliance (DA), with the latter looking set to emerge as a winner at the May 8 election, a leading analyst has said. Political analyst Daniel Silke said for all intents and purposes, the DA would dominate the upcoming polls in the province. Even the new regional political kid on the block, Good, led by former Cape Town mayor Patricia de Lille, would be no match for the regional goliath, he says. Silke said neither the ANC nor Good posed a real threat to the DA, which had entrenched itself in the province. According to him, the ANC had not done sufficiently to endear itself to the Western Cape electorate and, therefore, there was nothing to warrant the voters to change their minds about throwing their electoral weight behind the DA. Silke was reacting to the claim by ANC secretary-general Ace Magashule that the opposition in the province was set to grab the province from the governing DA. Magashule, campaigning in Cape Town at the weekend, said the ANC would oust the DA because it failed to deliver services to the people. “There are lots of challenges – people have no houses, no electricity – but there is hope and they all have hope in the ANC,” he told journalists as he embarked on a door-to-door campaign and putting up ANC posters on street poles in Philippi. “In fact, they think that the ANC is in charge of the Western Cape because they are telling us that there is no service delivery. The scandal-tainted Magashule said he based his statement on the expressed disillusionment by residents against the DA in the province. “The DA only took care of the elite while the poor people on the ground were left in the lurch under the DA,” he said. Ebrahim Rasool, ANC head of elections in the Western Cape, was buoyed by global rating agency Standard & Poor’s (S&P) commentary that “the best-case scenario is that the ANC wins and continues with the reforms that it started … a united majority win for the ANC would be good for the economic outlook”. In a statement, S&P’s sovereign analyst Gardner Rusike praised President Cyril Ramaphosa’s reforms that had helped to effectively strengthen institutions and root out corruption. “Not only is Standard & Poor’s affirming our movement’s new dawn, but they also went as far as to say that only the ANC is able to continue with reforms after the May 8 general elections to grow our economy,” Rasool said. Rasool said the Western Cape’s economic growth was as a direct result of the ANC-led government’s intervention to strengthening the economy, creating jobs and attacking investment. But Silke said there had been a lot of electioneering from all sides with those on the campaign trail claiming they were the best party to win the Western Cape, but none showed dramatic performance in the recent by-elections. “The ANC is not looking any good, it’s not going to get the growth necessary to unseat the DA in the Western Cape,” he said. “The claim by the ANC that it will win this province is largely electioneering. It’s a way to motivate the voters to come to the polls. “It looks clear that the DA will be able to scrape home by over 50%. 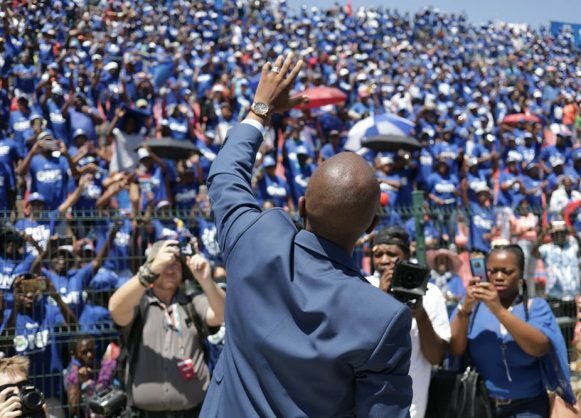 The DA is likely to remain the dominant party because there is no evidence showing that the ANC has grown sufficiently to defeat the DA,” he added. On the smaller parties, Silke said Good was not a serious threat to both the DA and the ANC but that it would still steal a percentage or two from the two parties. The EFF was worse because it never ran a serious election campaign in the Western Cape but it put much of its efforts elsewhere, he said.